One of the required characteristics of an Anusara yoga class is that it be centered around a heart-oriented theme. During our teacher trainings earlier this summer with Christina Sell, we were offered several ways to find and develop this essential component. Until this training, the whole idea seemed kind of random and a bit magical to me, something that required Divine inspiration. However, Christina systemically broke down the process for us and provided the proverbial ingredients behind the recipe. We examined three approaches that a yoga teacher can base a class around: the use of a personal trial or situation, messages from poems and stories, and an attribute or heart-based word analysis. How does this relate to Anusara Yoga (and Tantric) philosophy? How does this relate to chit ananda? How does this tie in to today’s practice/lesson? As a technology specialist in the local school district, I have the opportunity to experiment with a variety of software applications. There is a fabulous program which I highly recommend for just about anybody involved in creating presentations, whether they be verbal or written in nature. Though it was initially designed for as a tool for students, I find it helpful for anyone who likes to brainstorm project ideas. The software, Inspiration, creates an infinite variety of graphic organizers. It is a great tool, especially for anyone, but especially visual learners. You can diagram connections, and then with a click of a button, it turns your diagram into a well-organized text outline where you can add notes and hyperlinks for references as desired. You can create presentations, class plans, research papers and even plan a vacation with a few simple clicks. All of this and it’s fun too! The program comes with a variety of graphics built in to jazz up your diagrams, and you can add in your own custom images as well with simple drag and drop. (Think: yoga pose images in a sequencing plan!) You can export your outline directly to PowerPoint ~ it automatically creates your slides ~ or you can post your outline and chart directly to a webpage. During my family road trip last week, I used the travel time to review my class notes from our two teacher trainings. Then, I developed a graphic chart using Inspiration to help me visualize and streamline the process. (Hurray for laptops!) 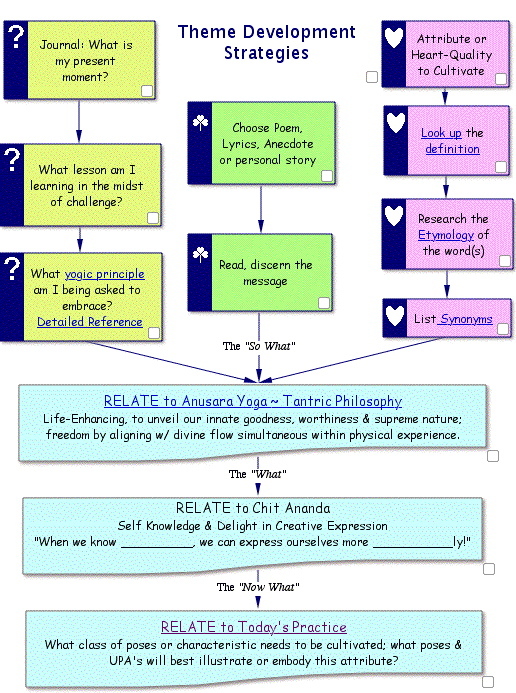 The chart reflects the ideas of Christina Sell and those of John Friend from the Anusara Yoga Teacher Manual. I just organized it into a form that worked for my particular brain processing. Note: Due to the file conversion necessary to post it, the hyperlinks in the chart do not work, but I have provided working links as text directly below the diagram for your reference. What yogic principle am I being asked to embrace? Here is another detailed reference on the yamas and niyamas. Relate to Today’s Practice ~ This links to another Inspiration document I created, an Anusara Yoga class template planning tool which I’ll post in the near future. Though certainly not all encompassing, I think the format is very workable, and would love your ideas, links and suggestions for improving it. If this appeals to you, you can download the chart and links I compiled as a Word document here: Anusara Yoga Class ~ Theme Development Template. To borrow from Christina’s teaching metaphor, it will give you a basic recipe to start cooking. Just season it with a little Divine inspiration and you can’t lose! I attended Mandy’s class yesterday where she based her theme on the niyama saucha. She did a beautiful job weaving the idea of orderliness, tidiness, purity, and cleanliness through everything from where we placed our mats and props to the careful placement of our shoulder blades on our backs. She reminded us that we are worthy of taking great care in establishing our foundation. Mandy demonstrated that the yamas and niyamas are great building blocks for theme development. Working with the chart above, the yama or niyama would be plugged in as the “attribute or heart-quality to cultivate,” and you simply work from there. You could also do the same with any of the six attributes of the Absolute. Perhaps this is obvious to you ~ or as we use to say in Boston, “Dawn over Marblehead!” ~ but I always need a few concrete examples to get me rolling. From their website, you can search a very large database of literally thousands of essays on hundreds of topics. The essays are 350-500 words and include themes of courage, love, determination, strength, and self-knowledge. (Anusara yoga teachers, are you seeing a pattern here?) Under the “Browse Essays” link you can see many of the topic headings. Anyway, I thought that this might be a good resource for AY teachers to look at for theme development ~ perhaps a place to find an opening story or anecdote to build on. ooh! a chart! I have such a thing for charts. another thing under the “now what” section that helped me a great deal is Christina’s idea of writing out the phrases she will use while teaching the class. So instead of just “courage” for example, she will make a list of phrases like “gather your courage” or “courageously”. Thanks for reminding me of that. I planned to build a list of words to link to this ~ from the teacher training manual and then related synonyms, etc. I will also work on the phrases. It’s hard to think of things sometimes in the moment and you don’t want to keep saying confidently, confidently, confidently. P.S. If you liked THIS chart, wait until you see the class one I’ve pulled together!